You’ve likely experienced this before: it’s the middle of summer and your air conditioner has suddenly stopped working or vice versa—your heating system is malfunctioning on a cold winter night. No matter the situation, it’s a big inconvenience to have HVAC problems when you need your system to be working at peak efficiency! In order to keep your home comfortable year round, you need to schedule routine maintenance. This regular inspection will allow a technician to discover potential problems with your equipment before they turn into inconvenient breakdowns and costly repairs. That way, your HVAC system can do what it does best—keep your family comfortable no matter what. At Bertie Heating & Air Conditioning, we offer a planned maintenance agreement—and it’s never too late to sign up. Contact our professional HVAC technicians to learn more! Let’s be honest: keeping a comfortable environment in your home promotes health and well-being for you and your loved ones. So how can you achieve that? By taking advantage of our heating and cooling maintenance plan, you can rest assured that our team will make your home’s atmosphere the best it can be. Sign up for your planned maintenance agreement or call 352-331-2005 to learn more from our HVAC technicians. Warranty protection. Did you know that if you do not have regular maintenance performed on your heating and cooling systems, it can void your registered warranty? Our maintenance program will help you avoid this and keep your system warranty intact. Energy savings. A well-maintained heating and cooling system will perform more efficiently than one that is not. Keep your energy bills low with our maintenance program. Discounted repairs. 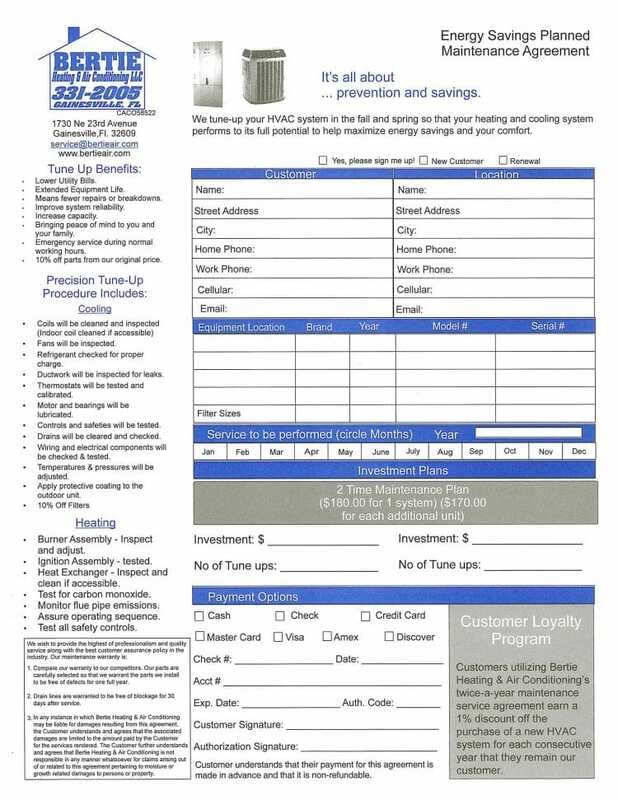 Any repairs your system may need will receive a 20% discount on parts and filters with our planned maintenance program. Peace of mind. With routine maintenance, you can be rest assured that your heating and cooling system is operating at manufacturer specifications. Loyalty program benefits. Customers utilizing our bi-annual maintenance agreement earn a 1% discount off the purchase of a new HVAC system for each consecutive year they remain our planned maintenance customer. Whether it’s a sweltering summer day or brisk winter evening, you should be able to rely on your HVAC system to keep your home comfortable at all times. At Bertie Heating & Air Conditioning, we have over two decades of experience in the North Central Florida area. Since we were founded in 1991, our NATE-certified team has serviced thousands of satisfied customers. Do you want to find out why Gainesville area families have trusted us with their HVAC maintenance services for over two decades? Call 352-331-2005 or fill out a contact form to get in touch with our heating and cooling experts today!